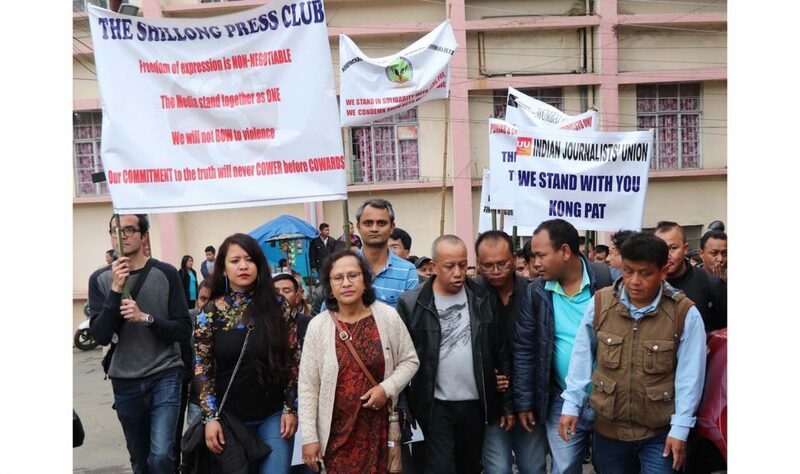 The journalists’ fraternity took out a silent march in Shillong on Thursday as a mark of protest against petrol bomb attack at the residence of The Shillong Times Editor, social activist and writer Patricia Mukhim. The silent protest march started from Shillong Press Club premises at Lower Lachumier in Shillong and passed through Barik Point, Shillong Civil Hospital point, Secretariat road, Raj Bhavan and culminated at the premises of the Shillong Press Club. The protesting journalists took out the march with placards and banners condemning the incident of petrol bomb attack on the reputed journalist with a call to the law enforcing agencies to nab those responsible for the attack and punish according to the law. The house of The Shillong Times Editor, Padma Shri Patricia Mukhim, was hurled with petrol bomb by some miscreants on Tuesday evening at around 8.35 pm. Police are yet to make any breakthrough in connection with the incident. Along with other journalists, the protest march was also joined by Shillong Press Club President David Laitphlang and The Shillong Times Editor Mukhim. It is to be noted that incidents of attacks on journalists and newspaper offices had also taken place in the past. Eight years ago, a petrol bomb was lobbed by miscreants at the office of U Nongsaiñ Hima, a popular Khasi daily on February 11, 2010. Police were clueless on the persons behind the incident.